Laserfleet is the long standing, recognized industry leader for providing Print Asset Management and Cost Recovery Solutions, both to corporate offices and to higher education institutions. Since 1988, we’ve helped our customers to track, monitor, audit, and control their printing environments. To accomplish this, we offer three different styles of Service Programs to choose from; Service Now!, A Modular Approach and Printrak. Each Program varies in its features, so the right one will fit perfectly to your specific needs. 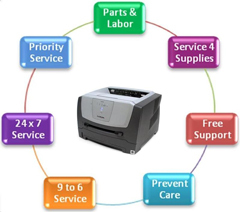 Service on Demand is the most widely utilized form of printer repair today. Laserfleet believes that time is money, and the importance of getting a service technician onsite ASAP is critical! However, not all companies are equal in performance. Call us at (313) 533-7309, to get an Authorized service technician onsite fast! When comparing service companies, there are four things a consumer needs to ask before authorizing anyone to perform work on their printer. This Printer Maintenance Program is based upon our Modular Approach, enabling you to mix and match our different. Service Modules in order to achieve a customized Maintenance System that works for you. Modules include: 24x7 Service, Emergency Service, Parts & Labor, Prevent Care and more. Select only the Printer Service Modules that you really need, in order to make your printing a success! Get Peace of Mind ~ No more worries about surprise repair costs. Our Promise to You ~ Find out the #1 pitfall to most Maintenance Agreements. Call Laserfleet today and we’ll not only tell you what it is, we guarantee we won’t do it! Is there a way to pay for a Maintenance Agreement based solely upon how much you use your printers? Absolutely! Our advanced Printrak software program is designed to monitor, audit, report and manage your printer fleet, copiers and fax devices. Finally, no more supplies or service invoices to contend with! With Printrak, you make one, simple and affordable monthly payment, freeing you from the difficulties of budgetary worries and guesswork. Reduce imaging supplies costs by 30%? Increase document security while boosting printer efficiencies? Eliminate the need for multiple vendors and suppliers, while reducing paper work? Monitor multiple printers from a single desktop? Pay a single, affordable monthly payment covering all aspects of inventory, supplies, and maintenance work? hp studies show that 90% of printing has no controls put on it. 18% to 24% of printed documents are never used, but discarded. 70% of information theft is done internally, with printed documents. Most IT Departments lack an accurate printer fleet database, due to fragmented purchasing done by outside Departments. After replacing any given printer, most companies have $150-$1000 of unusable toner left over. An average company overstocks on toner and ink, from between $500-$1500. Printing can be the third highest expense to a company. You can save up to 40% of your paper supplies with this device.